Most of the really good stuff I know, I learned from a dog. 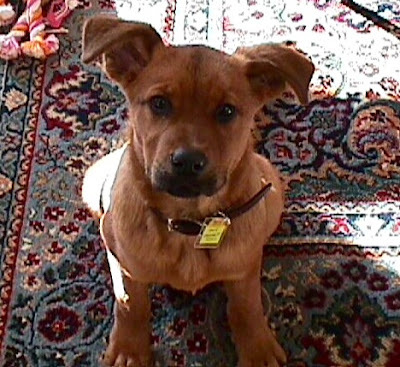 Although there have been countless lessons and observations over the years, the first really big lesson came when my first dog, Passion, was a puppy. She had done something "bad"—I can't remember what—and I yelled at her. I was really mad. And at some point during my rant, I saw her looking up at me with her puppy eyes and she was shaking, trembling with fear. That one moment changed me in so many ways. Seventeen years later and I still remember exactly how she looked and how ashamed I felt. To begin with, it held a mirror to my anger and the way I express it. Is this really who I wanted to be? Is this the mother I wanted to be? Second, I had enough empathy in the moment to see her situation—a helpless little girl with everything on the line, trying to be good. Did I have a right to make her feel unsafe? Aren't I supposed to protect her from people like me? Third, and most importantly, it left me with a critical decision to make. See, up until that point, my love was conditional. I treated her with love when she was good and when she was bad, I wasn't terribly loving. This caused a roller coaster of emotions for both of us. I wasn't sure I could handle a strong-willed, very alpha dog and so she couldn't feel safe I was her forever mommy. One look from that little girl and I was brought face-to-face with my inadequacy, my anger, my effect on others and my screwed up way of loving. It was excruciating. To this day, I don't think there's ever been a single more devastating moment in my life. Nor has there been one with more of an opportunity for healing. In that moment, I had a revelation—either I was going to learn to love her unconditionally, or I was going to continue on the same path I was on and end up hating myself more than I already did. I chose to start learning to love her unconditionally. And that's when a miracle occurred. Once I realized I was going to love her no matter what, I stopped getting so angry at her "imperfect puppy self" all the time! I mean, what was the point of sweating the small stuff if the result is always going to be loving her? What was the point if I was always going to hold her afterward and hope for her forgiveness? I may as well just skip all the drama and stress on both our parts and go straight to loving her and respecting her sensitivities and emotions, even when I'm mad at her. Of course, my dogs still piss me off from time to time. The people you love unconditionally are going to trigger you, too. But I handle situations differently now. And time after time when adjusting to a new dog, I come to a place where I stop trying to mold them into some perfectly behaved automaton and just accept them as they are. And every. single. time. things get so much easier from that point forward. The more I resist just loving them, the more stress and frustration I have. The more I surrender to them, the more love and joy I receive. This has translated perfectly to human-to-human relationships I've had over the years. If you have a family member that drives you crazy, for example, you can change a lot in regard to that without changing them. Just surrender to the fact that, regardless of their bad behavior, the end result is always going to be the same. You're going to end up loving them, even when you're hating them, because you have no choice. Or you can cut them out of your life, too. Both are paths of least resistance and both are legitimate choices, depending on the situation. But sitting on the fence just causes repeated pain. Before my experience with Passion, I applied that model to my father without even thinking about it too deeply. And the minute I decided to love him, even if he was never going to be the father I wanted him to be, I started enjoying our relationship more. And thank god, because he died soon after, so I didn't have to deal with him leaving while there was resentment in my heart. A lot of the pain we have in relationships happens upon the fulcrum of "should I stay or should I go?" Maybe it's not in quite the same words, but that's what it boils down to. Once you commit to a certain direction, that pain largely disappears. However if you find yourself asking "should I stay or go?" over and over again in the course of a relationship, it's because you either made the wrong choice, or you never fully committed to the choice you did make. Not long after that decision with Passion, I was faced with another choice regarding her. She had hip dysplasia and, due to the condition of her hips, her young age, the size she would grow to (100lbs) and the cost of care, I was advised to put her to sleep. So my "unconditional" decision was tested and I chose to get the operation. That pretty much sealed the deal for us as mother, puppy girl and the bestest of friends. After that, I never looked back. So your "conditions" might be tested in your unconditional relationships. But if you're in a never-ending cycle of "I can't take this anymore" after making your decision, you need to really search whether or not you made the right choice or if you are fully committed. Because resistance is what causes the struggle and pain in pretty much every big life decision. You're either resisting giving yourself over fully, come hell or high water. Or you're resisting change. Both are scary things, which is why we resist. I've struggled with whether or not to surrender unconditionally to each of my dogs, all of my siblings and both of my parents at one time or another. In the moment of anger and frustration, we truly believe we can cut them off. And, for some, that might be the right decision. But most of us can't and shouldn't. The death of my brother, especially, taught me that, when someone you "claim" you don't like dies or is faced with death, everything changes. Years of anger, pain and frustration melted away the second I heard "I've got lung cancer." In that moment, I finally saw that all the posturing and "he said, she said" meant little when the guy I knew and shared a life with from infancy is dying in a horrible, premature and heartbreaking way. Being human is hard. We're expected to open our hearts and to love people—and even pets—who will inevitably cause us pain, disappointment, sorrow and even heartbreak. Even the best of them will do that to us at some point. Unconditional love is a brave thing. And once you can do it for family and pets, you can open wider and start learning to extend it out to others, like friends, strangers and the all of humanity. And each time you manage to do it, the less pain you'll experience, the more love you'll net and the closer you'll come to aligning with that big unconditional lover in the sky.